Holidaymakers are heading back to Egypt's Red Sea resorts after a tumultuous year for the country. Tourist numbers in the Red Sea are up by 0.7% year on year, Egypt's tourism authority revealed at London's World Travel Market conference. The figures are similar to last year's despite a year which saw the country hit by violent protests which made headlines across the globe. 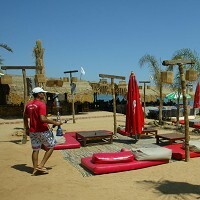 But Egypt has taken a number of steps to reassure holidaymakers considering a break at a Red Sea resort. Webcams would show potential tourists that the beaches in the South Sina region were not affected by the protests, said Omayma Elhusseini, director of the Egyptian State Tourist Office. However, though the Red Sea has escaped the worst of the troubles, tourism figures in other normally popular areas such as Luxor and Aswan have been hit badly. Meanwhile, the British Government is advising people against all but essential travel to anywhere in Egypt, except for Red Sea resorts such as Sharm El Sheikh. These circumstances mean tourists should now take more care than ever to obtain a suitable travel insurance deal. But at the press conference, Mrs Elhusseini told her audience she was hopeful the British Foreign & Commonwealth Office would relax its advisory soon, and Egypt's tourism minster Hisham Zaazou is due to meet British officials to discuss the matter this month. Mr Zaazou said more than 18 countries lifted the travel advisory on Luxor and Aswan and when the FCO revised its advice Egypt would work with its media, travel agent and tour operator partners to make it known that all Egypt is open. Webcams and mobile apps were helping to show how events were affecting Egypt, he added.